Chances are you’ve heard the story of Abner Doubleday, a man from Cooperstown, New York who invented baseball in 1839. As the story goes, Doubleday became a Civil War hero while his invention swept through the country with growing popularity. While a compelling tale, it’s nowhere near the truth. Today’s baseball evolved from two sports: cricket and rounders, both brought to the country by early colonists. Now, baseball is one of the nation’s most-watched sports. This is the hidden history of how baseball made its mark on the people and history of the United States. A French manuscript from 1344 depicts the first illustrations of people playing a game of what appears to be baseball, and it’s thought that the French had several variations of the game. England and Ireland concocted their own versions with cricket and rounders. The foundation of each game remained the same: two teams playing against each other, with the objective of hitting a ball with a bat and scoring points by running through four bases. In a 1744 British publication, a description of baseball showed the game as played on a triangle, rather than the modern-day diamond, and posts in the ground instead of bases. This is the earliest known written record acknowledging the game. The first recorded played game of “base-ball” was in 1749 in Surrey, with the Prince of Wales as a player. In 1755, an English lawyer named William Bray recorded a game on Easter Monday. This early version of baseball was brought to North America in the late 1700s. By the 1830s, there were reports of unofficial bat and ball games occurring throughout Canada and the United States. Modern baseball was finally beginning to take shape. Baseball Gains Traction in the U.S. Prior to the Civil War, town ball was a popular game in the Northeast. In 1845 New York City, a group of men founded the New York Knickerbocker Baseball Club. They founded the framework for the rules of game seen today: three-strike rules, diamond-shaped infield, and foul lines. They also decided against tagging runners by throwing balls at them, which had previously been used during games, deeming it dangerous. One year later, the Knickerbockers played the first official game of baseball against a team of cricket players, marking the beginning of a new era in sports. By the mid-1850s, residents in New York City were in a frenzy for baseball. As early as 1856, reporters were referring to the game as a “national pastime” or “national game.” By 1871, the National Association of Professional Base Ball Players was founded as the first professional league. The National League followed five years later, and the American League came in 1901. By now, nearly all modern rules of baseball were in place - the last change came in 1901 that counted foul balls as strikes. The National League and American League each had eight teams, and were constantly vying for the best players. They often dismissed the contracts between players and teams, leading to several bitter legal conflicts. In 1903, the two leagues finally reached a peaceful agreement, creating the National Association of Baseball Leagues to moderate the sport on a national level. The World Series debuted in the fall of 1903, pitting one team from each league against each other. In the first game, the Boston Americans of the American League beat the Pittsburgh Pirates of the National League. Baseball in the early 20th century was a notoriously low-scoring sport. That was until Babe Ruth arrived on the scene. 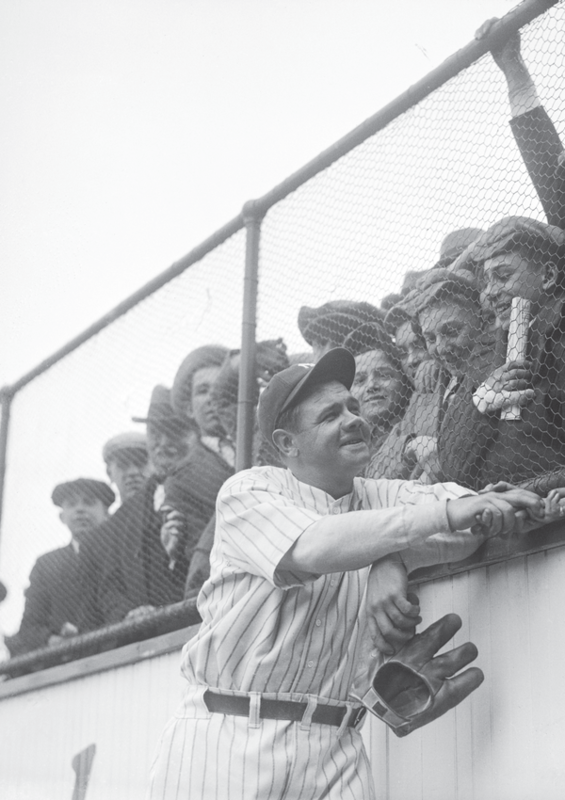 George Herman “Babe” Ruth Jr. played for 22 seasons between 1914 and 1935, and became known by such nicknames as “The Bambino” or “The Sultan of Swat.” He rose to fame playing for the Boston Red Sox as a left-handed pitcher, and later for New York Yankees as an outfielder. During his career, Ruth hit over 700 home runs, had over 2,000 runs batted in, and over 2,000 in bases on balls. In 1936, Ruth was elected to the Baseball Hall of Fame as one of the “first five” members to be inducted. He is commonly regarded as one of the best baseball players of all time. Likewise, Jackie Robinson changed the game when he became the first African American to compete in Major League Baseball, playing first base for the Brooklyn Dodgers. For ten years, Robinson had a stellar career. In 1947, he received the MLB Rookie of the Year Award and in 1949 won the National League Most Valuable Player Award, the first African American player to be awarded such a prize. He played in six World Series, and won one in 1955. In 1962, Robinson was inducted into the Baseball Hall of Fame. His uniform number, 42, was retired across all MLB teams in 1997, making him the first pro athlete in any sport to receive such an honor. As one of the longest-standing sports in American history, baseball has earned its title as “America’s pastime.” From its origins in bat and ball games from the early 1700s in Ireland and England, to the voracious support for the modern-day World Series experiences, baseball has made its mark on the United States. Talented players have used it as their stage to inspire nationwide social and political changes, and it is a sport that will continue to excite and animate generations to come.